Former Hibernian and Rangers midfielder Ian Murray thinks the Glasgow side's match sharpness gives them an advantage ahead of Wednesday's meeting at Ibrox. But the Dumbarton manager thinks the Edinburgh outfit are slight favourites over the two legs of the Scottish Premiership play-off semi-final. He pointed out that Hibs ended the season in second but had to wait while Rangers beat Queen of the South. "I think probably I would have preferred the games," said Murray. Rangers, who finished one place ahead of fourth-top Queens in the Championship, have only had a couple of days to recover after a 1-1 draw at Ibrox won the quarter-final 3-2 on aggregate. While Stuart McCall's side will be playing their third game in a week, Hibs have not played since finishing the league season with a third straight victory in which they swept aside Falkirk 3-0. 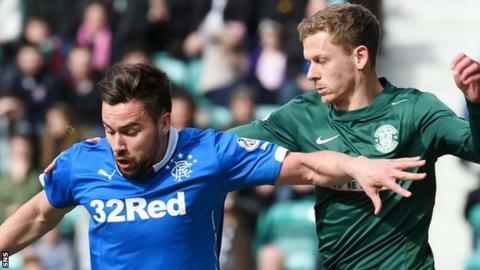 "I think the break Hibs have had to endure has been quite long in terms of the physical and mental side," 34-year-old Murray told BBC Scotland. "At least Rangers and Queens knew exactly who they would be playing and the training would have been tailored for that." An October 0-0 draw with Hibs in Edinburgh was the only time Murray's Dumbarton avoided defeat in their 10 meetings this season against Wednesday's protagonists. However, it was Alan Stubbs' side who finished runners-up behind city rivals Hearts and are 3-2 ahead in wins against Rangers this term. "I think you have to look at the league and say Hibs are marginally favourites," said Murray. "They finished above Rangers in the league and then you look at the head-to-heads and Hibs have prevailed on that front as well this season. "It is one of these ones where, if Hibs win tonight at Ibrox, nobody's that surprised and, if Rangers win, exactly the same. "It is a two-legged game, so it is slightly different." Stubbs has dismissed the suggestion that Hibs lack big-game "bottle" after losing two recent Scottish Cup finals and last season's Premiership play-off against Hamilton Academical. Murray pointed out that the Edinburgh side had risen to the occasion in their bigger games during the current campaign. "If you look at Hibs record against Rangers this season, it is very good," he added. "If you look at Hibs record against Hearts this season, it's very good as well. "I don't see Rangers losing at Ibrox and, if they win, I can't see it by more than a goal. "So I think the second leg will be all to play for. The difference is so marginal."